Conscious Capitalism, Inc. co-Chairman and CEO Doug Rauch announced the date and initial presenters for Conscious Capitalism 2014, April 9 – 11, 2014 at Paradise Point Resort in San Diego, California. “In the spirit of one of my mentors, Peter Drucker, who had the insight that ‘culture eats strategy for breakfast,’ CC 2014 will focus on the power of Building Fully Human Organizations,” Rauch commented. “We are delighted that Dov Seidman, acclaimed author of How: Why How We Do Anything Means Everything, will kick off CC 2014 with his profound, research-based insights, and Raj Sisodia, co-Chairman of Conscious Capitalism, Inc. and co-author of best-selling Conscious Capitalism: Liberating the Heroic Spirit of Business, will close the first day of the gathering with a compelling case for Conscious Culture in business,” Rauch continued. CC 2014 is designed for CEOs and their executive teams, executive team members and entrepreneurs, as well as consultants and coaches who serve and support them. This two-day event is designed to deepen participants’ practical application of the principles of Conscious Capitalism. More than thirty-five practicums, designed to deliver practical tools and best practices for applying the principles to everyday decisions, will form the foundation of the program. A small number of high potency keynote presentations and rich opportunities to connect with and learn from peers will round out the program. For more information about Conscious Capitalism 2014, visit the Conscious Capitalism web site or the event registration page. ABOUT CONSCIOUS CAPITALISM. 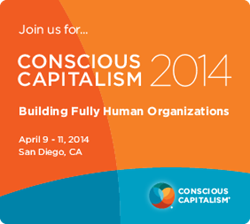 Conscious Capitalism is a movement dedicated to elevating humanity through business.